Graco Magnum X5 vs X7? Choose the best paint sprayer for you? 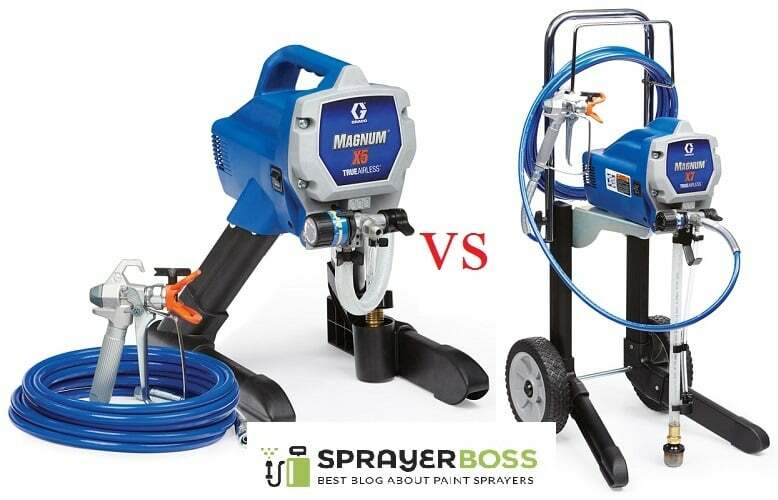 Home » Airless Paint Sprayer » Graco Magnum X5 vs X7? – Which one is best paint sprayer for you? Do you have confusion choosing whether to buy Graco Magnum X5 or Graco Magnum X7? Or Are looking for airless paint sprayer as professional or householder for occasional needs? Then you have come to the right place! Here you can see the difference in details between these two and choose what is best for you. At the end of this article, you will surely have a firm idea about Graco Magnum X5 vs X7. 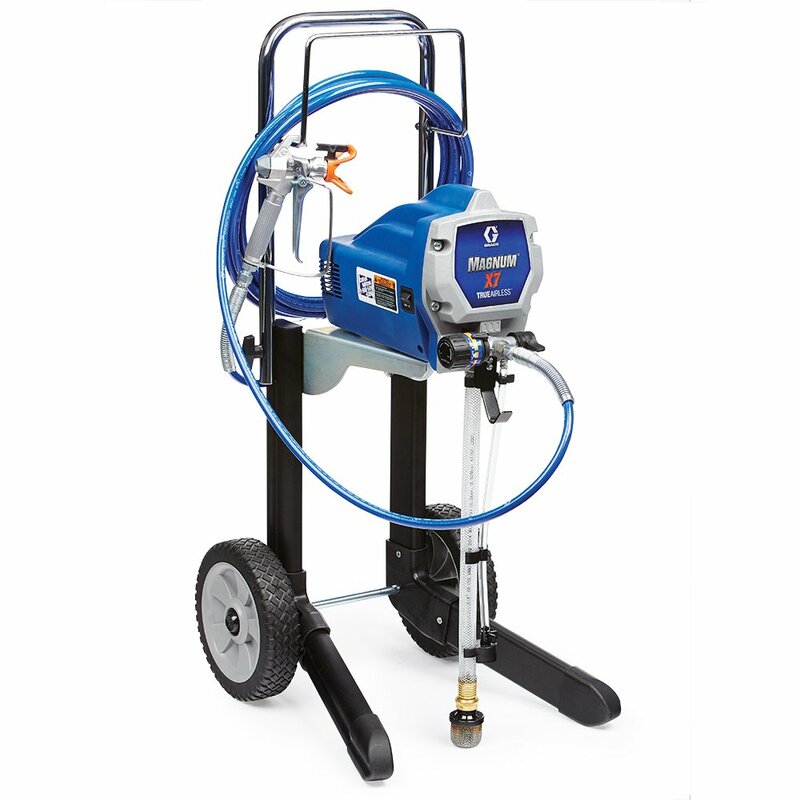 Graco is one of the leading and popular paint sprayer company who manufactures some quality paint sprayer. 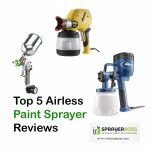 By airless paint sprayer they mean there is no need for an air compressor. Various models are available in competitive price in the market. Magnum category is a professional product for this brand. Let’s take a look at both models and their features. 1.0.1.1 In short: x5 is best suited for household painting. 1.0.2.1 In short: x7 is best suited for the larger project such as industrial applications. According to the manufacturer, Graco Magnum X5 is not a professional painter tool. X5 is specially designed for them who plan to use it for less than 125 gallons a year. It can not handle asphalts, textures but it can spray stains, latex, oil, acrylic. In short: x5 is best suited for household painting. Magnum X7 is more powerful than X5 around 15%. The piston pump is stainless steel and two flexible hoses. The sprayer is easy to paint in a few seconds. It can be used for heavy use of painting work. In short: x7 is best suited for the larger project such as industrial applications. X5 and X7 both have metal made spray gun and the main ingredient of the metals SG2. Both have RAC IV 515 tip. The dimension of paint hose for both of the prayer gun is ¼ inch in diameter and 25 feet long. Graco X5 and Graco X7 can provide usage up to 125 gals per annum. Both of the machines can perform maximum 3000 psi of pressure. Cleaning is an important part of your paint sprayer to ensure it lasts long without declining the performance. For some of the other sprayers have difficulties with the cleaning process. But not with the Graco Magnum X5 and X7. Cleaning the machine is easy with the Graco X5 and Graco X7. In order to help to clean out the clogs, both have a reverse-a-clean sprayer tip alongside the power flash adapter. The last thing that the customers don’t want their sprayers is to break it in the middle of an important painting project. But luckily, most of the customers agreed that both of them Graco Magnum X5 and X7 has a very long lifespan. It is all thanks to the easy cleaning of these machines. Most convenient Features of these two machines are the cleaning features. These features not only make your difficult cleaning job easier but also make sure that your machine lasts a longer period of time. Graco Magnum X5 and Graco Magnum X7 both have Pump Amor, Gun Filter, Variable Pressure Controller, Flexible Suction Pump, Lighted PowerPlug, PushPrime included the core part of spray machine. Pulling option from 1 or 5 gal container is also included in both sprayer gun. And of course, both magnum sprayers have the user manual to start painting in an instant. Both of these product features a one-year warranty. Although it seems a short period, most of the customers agreed that these products last a longer period of time. In most cases, most of the paint sprayer customers voted that both of the machines are worth the money that they cost. Now let’s discuss on some of the features of Graco magnum X5 and X7 on which you can take the best decision whether to buy X5 or X7. Graco Magnum X5 can spray .27 gal in one minute while Graco Magnum X7 can do .31 gal in one minute. So Graco Magnum X7 can provide better performance for the bigger project. The most common complaint about Graco Magnum X7 was that the hook of the paint bucket cannot hold the weight of the bucket for a few customers. In short: For less time consumption Graco Magnum X7 can provide better painting service. Graco Magnum X7 has a cart system to move the entire painting system easily from one place to another. Graco Magnum X5 has a stand at the lower part in order to hold the whole machine. In Short: if you are looking for stand type then grab X5 but if you are looking for larger space painting machine then you can go and grab X7. X7 tip size is .17 and X5 has the tip size of .15. An Important component of a paint sprayer is the Hose. Between Graco Magnum X5 vs X7, the X7 has 100 feet hose and X5 has 75 feet hose. Between The Graco Magnum X5 vs X7, the X5 has the lighter weight of 13lbs and the X7’s weight is 23 lbs. If you are only doing a lighter small project or only household work then X5 is suitable. But if you are not only thinking about a lighter project but also the bigger project then X7 is the best-suited product. To make a better choice it is mandatory to check the horsepower of the machine. It is one of the core attributes for taking a decision about the machine is powerful or not. Between Graco Magnum X5 vs X7, X5 has 1/2 horsepower and X7 has 5/8 horsepower. According to your need, you have to choose what you should use for your painting projects. Both of X5 and X7 are long lasting and very effective airless paint sprayer. Because of its very easy cleaning features, both of these machines won’t get clogged or damaged very often due to poor cleaning. There is always extra space while you are working because of the long hose of these machines. Plus for Graco Magnum X7, there is a set of wheels for enhancing the mobility of the machine. A common complaint about both of the machine is the length of the hose that the sprayer comes with. The hose is 25 feet long which is not enough in some customer’s eye for their project. And because of that, they buy another hose. X5 has an additional complaint that it does not have wheels as X7 has. Which makes the mobility of the machine difficult. These DIY airless paint sprayer machines have their difference and to some extent, the preference may be little different in some areas depending on what the job is at hand. But in general between Graco magnum X5 vs X7, the X7 can be preferable for its mobility. Because of its mobility working on any project gets much easier. 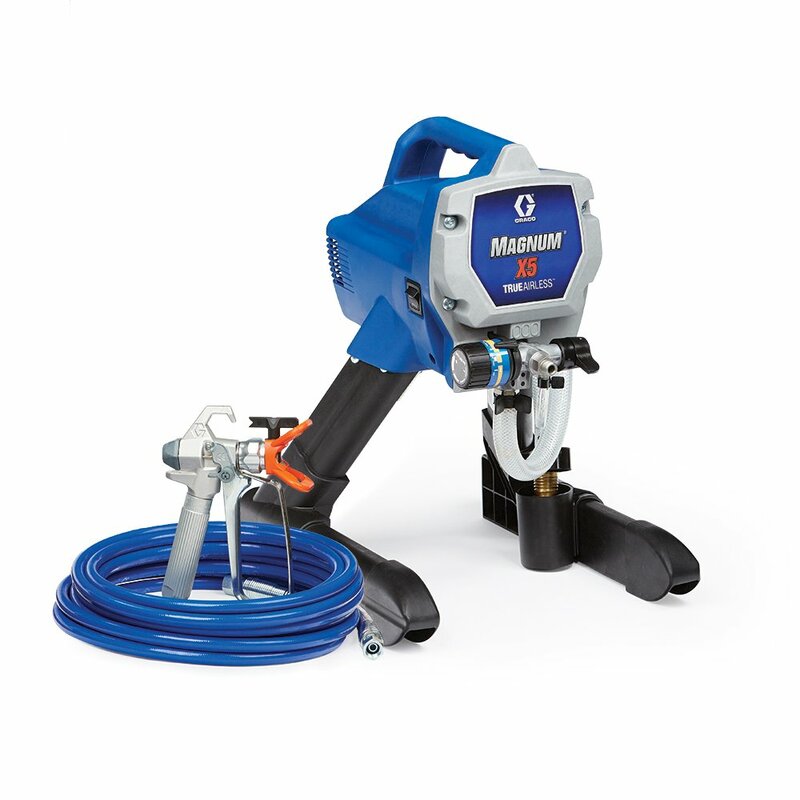 So, if I have to go to the market and searching for a new DIY airless paint sprayer that I can use for almost any project easily, I would probably go for the Graco Magnum X7. Because it has the portability and also can be used with a longer cord. But you may think about the budget. In that case, you might want to go with the Graco Magnum X5 DIY airless paint sprayer. This also wouldn’t be a poor choice because it is highly rated by the customers as a quality product as well.